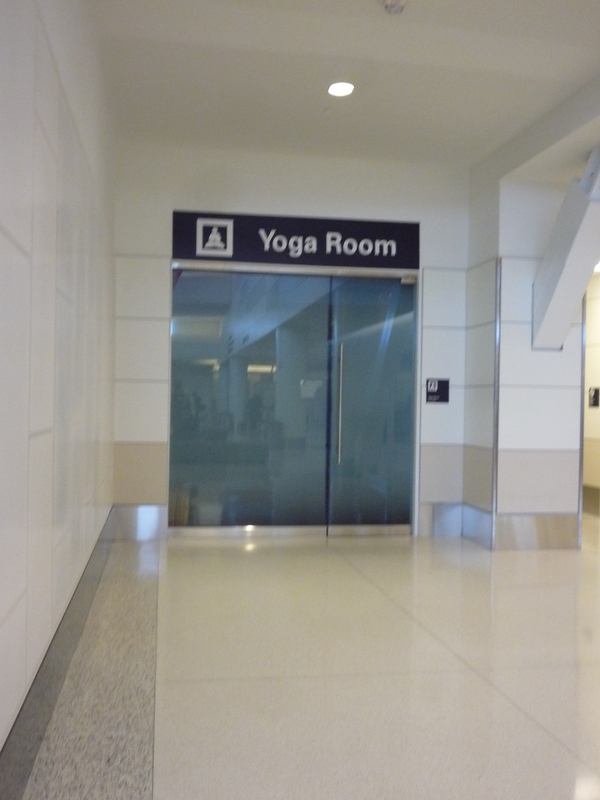 Live Report from SFO’s Yoga Room! As you may know I got married two weeks ago (more on that here). We took our honeymoon driving up the California coast in a mini cooper convertible from Santa Barbara to Napa with stops in Big Sur, Hearst Castle, Monterey Bay Aquarium, Napa, and Muir Woods. We flew out of San Francisco International Airport, and after a hellish unexpected 4-hour layover in LAX at the start of the trip (note: LAX isn’t a good place to be a vegetarian), SFO was like an airport dream come true. Aside from the wide selection of food and shopping options that I’d be interested in even if I wasn’t held captive, there’s the famed new yoga room. Seeing it was like spotting an oasis–I was sad that the trip was ending and that we had a cramped 6-hour flight in front of us (don’t believe what you’ve heard about honeymoon upgrades). The room is small and dimly lit–I would guess less than 5-6 people could comfortably practice in it, and while you can still here the frequent terminal announcements, it still felt like a place of refuge. I used the room for only about 15 minutes just before boarding my flight and there was only one other person in the room the whole time–a woman who for the first 10 minutes I’m pretty sure was napping. The room is stocked with mats, blocks and bolsters and while I wasn’t wearing yoga clothes, my traveling outfit still afforded enough movement to move though some hip-openers, twists, and a couple sun salutations. During the time I was in there, the door was opened about 10 times with curious travelers peeking in then leaving, but I imagine as it’s around for longer that will taper off. When I was done I felt soooo much more relaxed and that combined with the presence of my new husband helped me through the next 6 hours with a baby screaming throwing things at us. 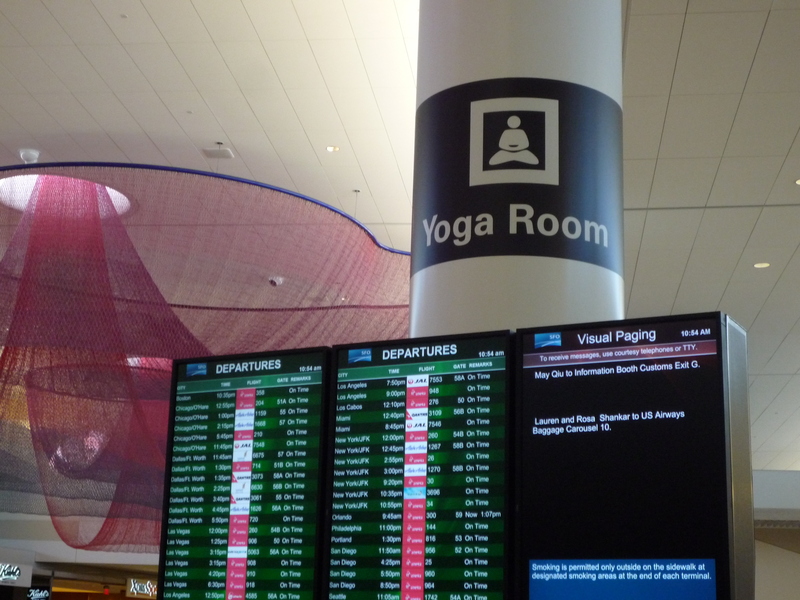 Every airport should have a yoga room–it makes the constant degradation of air travel so much more bearable. 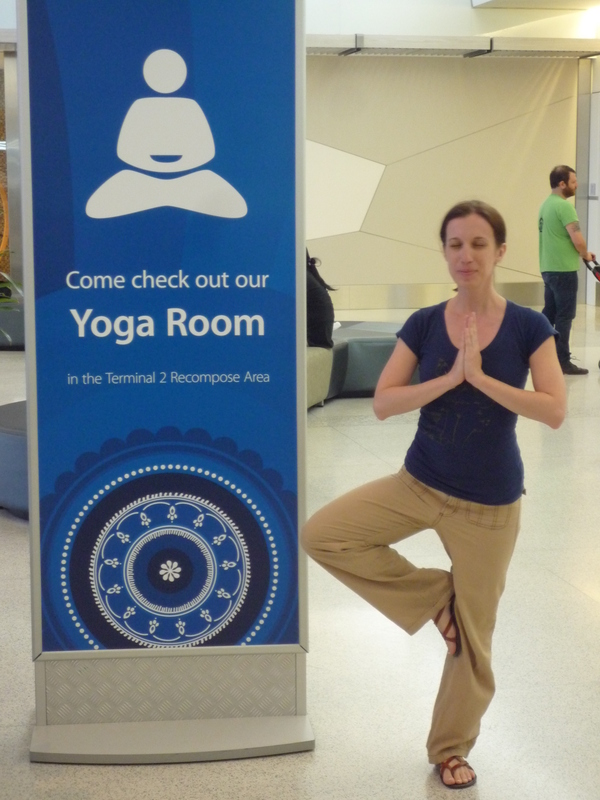 San Francisco Airport has a Yoga Room! When are we to see one in Heathrow?